The ongoing strengthening of the US dollar could shift the FOMC further into dovish territory. 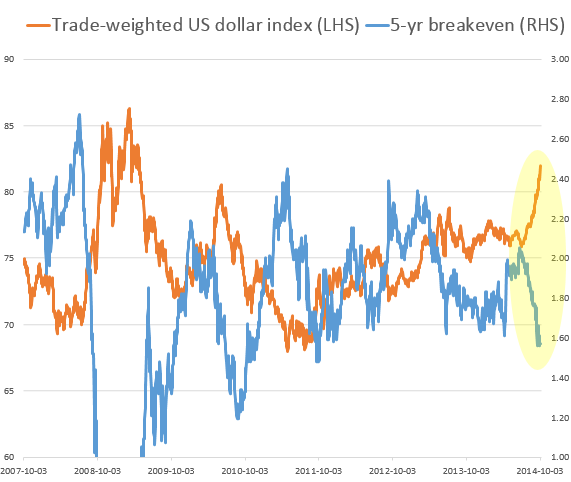 While the labor situation continues to improve, the dollar's recent appreciation has contributed to declines in inflation expectations (based on TIPS breakevens) to multi-year lows. Another way to think about this is that lower inflation expectations are equivalent to higher real interest rates - a form of "market-generated" tightening in monetary conditions. Central banks generally don't like to tighten policy when real rates rise sharply. Part of the reason for weaker inflation expectations has been the decline in commodity prices - which to a large extent resulted from stronger US dollar (as well as slower growth expectations in China). A widely-tracked broad commodity indicator called the Continuous Commodity Index is now at the lowest level since 2010. Moreover, stronger dollar lowers prices of imported goods in the US. After a period of declines last year, growth in import prices finally turned positive this summer, providing support to the CPI. But as the dollar started appreciating, import prices began falling again, lowering US inflation and inflation expectations. We saw signs of that in August and are likely to see more declines in September (the report comes out in a couple of weeks). The Fed watches market-based inflation expectations quite closely and the dovish FOMC members may use this as an excuse to press for delays in rate normalization. If the US dollar appreciation continues at the current pace, the FOMC's dot-plot will begin to move lower.